As many of you know, I’m involved in a local community group raising awareness of human trafficking here in Craigavon. We get lots of emails from people across our wee country that are really interested in the issue and want to do something. In the last few months, there has been such an outpouring of attention on trafficking here in Northern Ireland. The media is starting to sit up and pay attention, local residents are starting to take ownership of the issue and it feels like the ground here is ripe for action. It NEEDS to be ripe for action. On Friday past, we joined with around 200 other people in the Seagoe Hotel in Portadown to hear more about the enormity of the problem here and were inspired to get our hands dirty and DO SOMETHING. 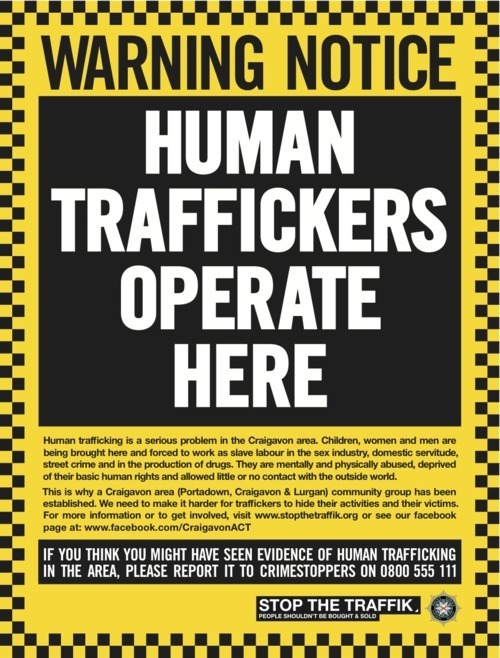 As co-ordinators of our ACT group, opportunities to talk to people about trafficking are coming at us fast and thick. Laura and I could cram our diaries with the amount of requests we are getting from people wanting to know more and get involved. It really is such an important and exciting time. - Northern Ireland has the HIGHEST DEMAND FOR SEXUAL SERVICE THAN ANY OTHER COUNTRY IN EUROPE? - The average price that is paid for a 1/2 hour of sexual service is £97 - which works out making a pimp/trafficker up to £25 million from ONE victim in ONE year. Last week, we met with 20 young people from one of Belfast’s hardest estates in Ballysillan to introduce them to the issue. We were so encouraged by their response. This week we are meeting with a church in Belfast to share our story so far as they begin their own initiative to take action, and we are also doing the same with a group of international students at a YWAM base in Rostrevor. I get the feeling that the tide is about to turn and a proper band of dedicated abolitionists are rising to their feet to say ‘Enough is enough. Freedom is for everyone. NOBODY should be bought and sold’. “In 1786, a meeting was organised by a merchant called Waddell Cunningham, who just returned to Belfast from New York where he’d made his fortune in trade. The meeting was held in the Assembly rooms (the old Northern Bank building) on Donegall Street and it’s purpose was to attract other investors for a new trading company. Cunningham was confident that this proposed company would make fortunes for himself, the other investors and the city of Belfast as similar companies had made the cities of Bristol, Liverpool and Glasgow rich. One man, Thomas McCabe, a member of the First Presbyterian Church in Rosemary Street attended the meeting with the intention of disrupting it. INCREDIBLE HISTORY! We need to tell the story of Thomas McCabe. We need to take energy from such boldness and ferocity. The reality is that although his protest made waves and stopped the process of a slave ship coming into our country, slavery in it’s most violent and sinister form is still lurking around OUR streets and in OUR towns, effecting people that have no voice. I hope we can stand on the shoulders of giants like McCabe, who raised his voice to oppose such injustice and I really believe, like him, we have the ability to stand up and interrupt the horrors of trafficking happening here, now.